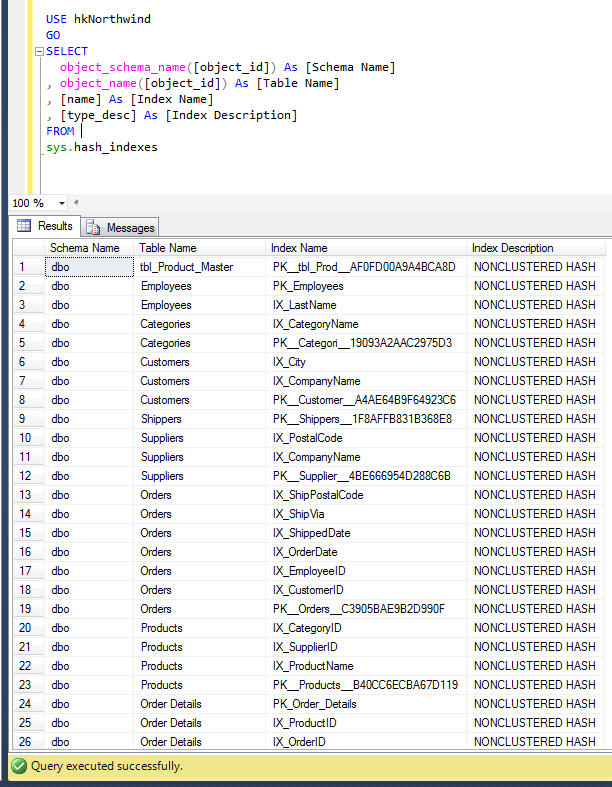 HASH index (NONCLUSTERED) is a new type of index introduced in SQL Server 2014. It is only supported by memory optimized table. Recently, I was working on a memory optimized table and I came across in a situation where I had to find all the hash indexes available in the database. As usual I got it from a system view (sys.indexes). It is nothing new but the story did not end here because I found a shorter way to get the list of non-clustered hash indexes. Given below is script that can give you the list of all hash indexes available in any particular database. Recently, I was working on SQL Server 2014 CTP 1 and doing my usual research, and came across the new system objects shipped with CTP 1. 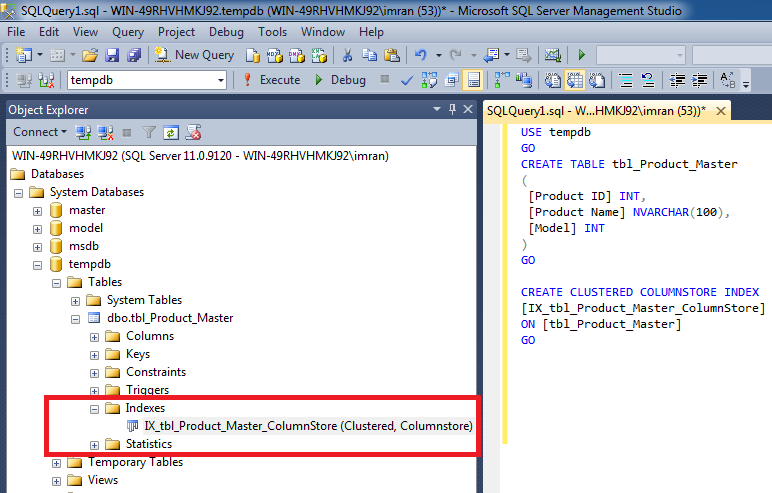 Columnstore index is one of the nice features introduced in SQL Server 2012. It improves the performance more times than the normal query but on the other hand it has some limitations as well, and one of the limitation is that you cannot create a CLUSTERED Columnstore index. Let me demonstrate it in SQL Server 2012. Ooopps…… I am unable to create it in SQL Server 2012. The above limitation has been eliminated in SQL Server 2014 and you can add the CLUSTERED COLUMNSTORE INDEX in the table. Let me demonstrate the same example in SQL Server 2014. Lets check whether the index has been created successfully or not. The result is evident above, in SQL 2014. Let me know if you explore the other nice enhancements of SQL Server 2014. 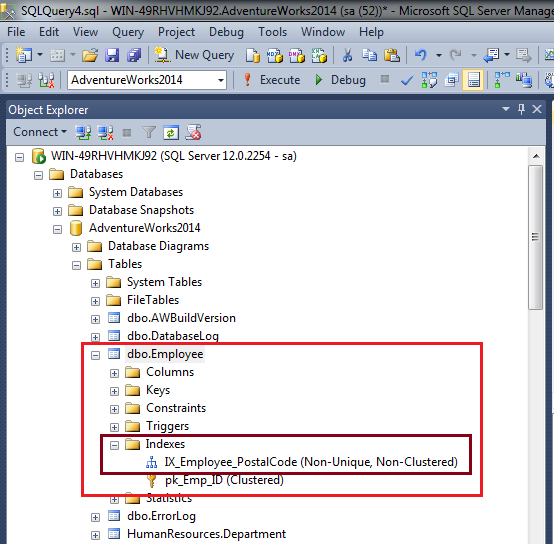 In my earlier article, I had discussed about new features of SQL Server 2014. Those features are very exciting and I was waiting for the CTP. Now, CTP 1 is available for download. Given below are the few instructions that you should follow to install CTP 1. The machine should not have any earlier versions of SQL Server. There is no upgrade / side by side installation available in this CTP. This CTP is only available for X64 architecture. System requirement for SQL Server 2014 is available here. Let me know if you face any issues with the installation. SQL Server 2014 was announced a couple of weeks ago during TechEd North America Conference 2013. So, I started research about its features and I found few features very exciting to me. Given below are the details of the few features available in SQL Server 2014. In-Memory OLTP : It improves the performance of database applications about 50x as compared to the normal database application. It can achieve significant performance. Enhanced In-Memory ColumnStore : Now, you can update the columnstore index (woww) , also you can apply a new option called COLUMNSTORE_ARCHIVE for higher compression and storage space savings of as much as 90 per cent in columnstore index. Buffer pool extension to SDD (solid-state drives) : SQL Server improved the query performance by allowing the use of non-volatile devices (e.g solid-state drives (SSDs)) to reduce usage of SQL Server memory with no risk of data loss. Enhanced Query Processing : SQL queries became much faster due to the enhancement of query processing and one of the reasons why querying process became faster is, it separates querying into two steps, decision-making and execution. Enhanced Always On : Now it can support up to 8 secondaries. Backup to Azure : SQL Server can take backup and restore directly to the Windows Azure Blob service. Resource Governor can provide better control and performance for different types of workloads in SQL Server applications. SQL Server Audit Enhancements : Auditing became more easier because it is enabled by default and it will record each and every database activities, including database reads, with minimal impact on performance. Let me know if I missed out any important features.